Gemstore banner images have returned! 1896624_0638 Answer the call of the Underworld with the new First Follower Desmina Outfit! 1896625_0405 A choya pinata comes down to finish off your opponent. 1896624_0278 Elonian Landscape Dye Kit now available! 1701553_0704 In the Mystic Forge, combine a Gift of the Oasis, a Gift of the Highlands, a Gift of the Riverlands, and a Gift of the Desolation to create a Gift of the Desert, used in crafting legendary weapons. 1701553_0226 In the Mystic Forge, combine a Spirit of the Raptor, a Spirit of the Springer, a Spirit of the Jackal, and a Spirit of the Skimmer to create a Gift of the Rider. 1711443_0307 In the Mystic Forge, combine a Gift of the Desert, a Gift of the Rider, a Bloodstone Shard, and 250 Funerary Incenses to create the Gift of Desert Mastery. 1701553_0282 Use artificing to refine into Shards of the Dark Arts, used to craft the legendary focus precursor Ars Goetia. 1701553_0573 Used to craft the legendary focus precursor Ars Goetia. 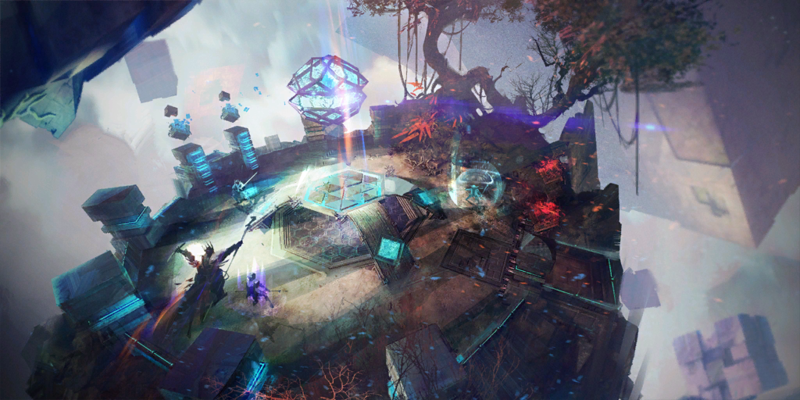 Combine in the Mystic Forge with Mystic Runestones, a Gift of Energy, and a Gift of the Mists to create the Gift of Ipos. 1825755_0129 Train the Volatile Magic Resonance Mastery to gain ability to collect volatile magic. 1773903_0834 Can be traded with vendors in the Domain of Istan, used for crafting, or consumed for Volatile Magic. 1716723_0039 Double-click to teleport to the Chalon Docks in the Domain of Istan. This item cannot be used while in combat. 1773904_0158 Store living world portal scrolls inside of this tome. 1716723_0576 Permanently gain 10 bonus experience while in Istan. Stacks up to 3 times. 1716723_0676 Permanently gain bonus karma while killing foes in the Domain of Istan. Stacks up to 3 times. 1773903_0505 Combat Tonic: Double-click to transform into an Awakened or return to normal. 1862783_0313 Can be placed in the Mystic Forge along with other bookmaking materials to create a Meditation Logbook. 1862784_0114 Become one with the Mists and gain the following: • The "Fractal Champion" title • 5 agony resistance, 2 increased outgoing damage, and 25 health per second in fractals for every character in your account • 1 additional fractal encryption and bag of fractal relics from the final chest in every fractal Level 3 of 4—Effects stack with previous level. 1862783_0853 Every character in your account permanently gains 5 agony resistance in fractals. Level 1 out of 4. 1825766_0752 Permanently gain an extra Writ of Tyrian Mastery from the final chest in every fractal. Level 1 out of 4. 1862778_0817 Permanently gain bonus karma from the final chest of every fractal. Level 3 out of 4. 1877044_0517 You must have at least Fractal Empowerment 2, Karmic Retribution 2, and Agony Impedance 2 to purchase Mist Attunement. 1877044_0897 You must have a Personal Fractal Level of 100 to purchase Agony Impedance. 1877043_0656 You have acquired an item that can be used to open locked chests! To see how many you have, open the Wallet panel from your inventory. 1862780_0631 Your soul has dissipated. You are dead.